So you’ve decided to go with Suddenlink for cable internet–that was a good choice. Their no-contract internet plans and well-priced bandwidth make them an attractive service for any household. Now you’ve just got to find a Suddenlink-compatible modem to get your internet up and running. A lot of people simply rent the local provider’s modem at this point, I’ve been there too–the evening after a big move, I wanted pizza and Netflix, not to go comparison shopping on Amazon. Turns out I could have saved a lot of time and money in the long run by doing some thinking about it before I needed to. To help you avoid the same mistakes, we’ve reviewed our top 5 Suddenlink compatible modems to consider once you’ve got your internet service. The first reason to buy your own modem instead of renting from the cable company is simple: owning saves money, while renting drains it every month. 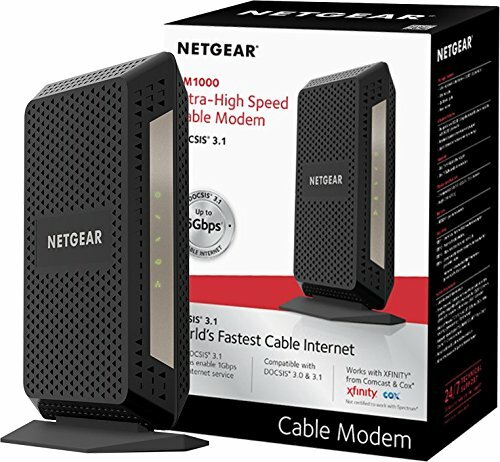 As Dann Albright from MakeUseOf points out, if you buy a modem for $100 instead of renting it for $10 per month, you’ll be saving money in less than a year. Depending on what you’re paying for Suddenlink already, that could make the difference between an affordable and bank-breaking plan. BusinessInsider goes further, suggesting you’re burning money if you don’t purchase your own unit. As that article points out, though, money isn’t the only reason to buy a modem instead of renting it from Suddenlink or any other ISP. You can also gain speed, functionality, and flexibility by taking control of your own unit. As CNET points out, ISPs often like to bundle routers and modems together for rental, which makes it a lot harder for the end user to change anything–if you want to make any changes to your broadband speed with a combined device, you’ll have to replace your whole system, not just your modem. What about speed and performance? When you can choose your own product, you’re much more likely to find the modem that’s right for you. Don’t listen to your provider when they suggest it won’t be possible to find a modem better-suited to the speeds you’re paying for. You absolutely can–you just need to shop smart. First things first: not all modems work with all ISPs. This is often given out as a reason to rent, but the list of models compatible with each provider is almost always publicly available. You’ve got Suddenlink, so study the list of modems they’ve approved; we’ll be listing the best ones here, but it doesn’t hurt to be aware of the whole range. If you find a modem we don’t list and aren’t certain, you can always contact Suddenlink customer service. Can It Handle The Speed? Once you’ve determined you’ll be able to use the modem you want, the next step is to make sure it can handle the download speeds available through your internet service. To transmit data, cable providers use a standard called DOCSIS (Data Over Cable Service Interface Specification) that’s currently in its third (3.0) version. The video below that explains this next part, but if you don’t have time or privacy to watch right now, just know that all modems have a certain number of channels for uploading and downloading information. The minimum standard for DOCSIS 3.0 is four “down” channels capable of handling at least 38 Mbps each, and four “up” channels with at least 27 Mbps each. That’s 152 Mbps down, 108 up. Many modems have more channels with more capability each. Some on the market right now can make it up to 688 Mbps. You probably won’t need that much, but you’re likely to need more than 100, so don’t assume the minimum is enough. All this just goes to explain that if you’re paying for 100 Mbps of service from Suddenlink, you need to have at least a DOCSIS 3.0 modem. Luckily, almost all Suddenlink-compatible modems do support DOCSIS 3.0. But it’s critical to make sure your modem is able to handle all the speed you’re paying for–otherwise, once again, you’re burning money. Just don’t forget: that works the other way too. Your modem can’t produce speed your ISP isn’t sending. 200 Mpbs on a modem that’s built for up to 500 is still just 200. If you’re only on a 50 Mbps plan, buying a DOCSIS 2.0 modem (that’s compatible with Suddenlink) can save you a lot of money. If you’re a casual reader and that was a lot of numbers too fast, don’t despair. You don’t need to know all about the backend to make a smart purchase. The knowledge is just a great tool to have in your box. One last thing: Ethernet ports on routers are one more place where the speed you’re paying for might get slowed down before you have a chance to use it. Some are only built to transmit 100 Mbps or less. Be careful your router has one with the capacity you need. Think of your home internet as a chain of products–modem, ethernet port, router–that can only run as fast as the slowest link. Keep this in mind and you’ll get the best possible value out of your money-saving modem purchase. The following are some of the best-rated Suddenlink-compatible modems available. Each one is listed along with a brief discussion on speed, compatibilities other than Suddenlink in case you ever decide to switch plans, networking, installation, and security, plus some pros and cons. 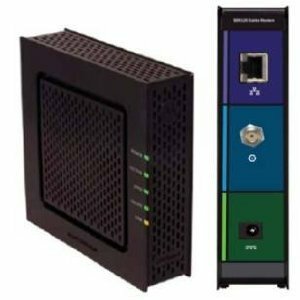 Not only is it fast–and that refers to setup and installation, as well–it boasts a broad in-house range and the highest popularity among consumers of any modem for two years running. This means that any major issues that do come up will be familiar both to professional technicians and to other users. Be careful with color. Only the white model is brand new; the black model, which will be sold in a brown box, is used or refurbished. Also, some users have complained that the blue operating lights are extremely bright. Speed: 343 Mbps download, 131 Mbps upload, on 8 download channels and 4 upload channels. 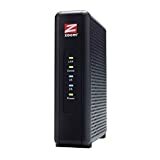 DOCSIS 3.0 compatible and ideal for internet plans providing up to 100 Mbps (but remember, if your plan offers less, this modem won’t make your internet any faster). Compatibility other than Suddenlink: Spectrum (Charter, Time Warner, Brighthouse Networks), Cox, Mediacom, Comcast Xfinity. Not compatible with CenturyLink, Verizon, or AT&T. Uplink to the router through a Gigabit (1000mpbs) ethernet port. Networking: No wireless; requires ethernet cable. 8 download channels work simultaneously for file downloads. Installation: Quick start guide available with product or online. Installation videos can also be found online. Most sales include a 2-year warranty. Initial setup help on all products is also available through SuddenLink. Security: Complies with all DOCSIS 3.0 Medium Access Control (MAC) security standards, which mandate encryption to protect user privacy and retain the right for ISPs to refuse service to unlicensed modems. Blindingly fast. I don’t think any internet service currently exists that provides more speed than this modem can handle. Setup is also fast and easy, and if you’re concerned about whether it’s too much power for a regular service, don’t be–the CM1000 works both with speeds requiring DOCSIS 3.0 and 3.1. Not as justifiable a purchase for many lower-speed household internet plans. Also, with the enormous speeds, it’s running at, the product can run extremely hot. Speed: With 32 download channels and 8 upload channels, the CM1000 is compatible with any internet plan up to 1 Gigabit–technically 6 Gigabits, but the ethernet port tops out at 1. 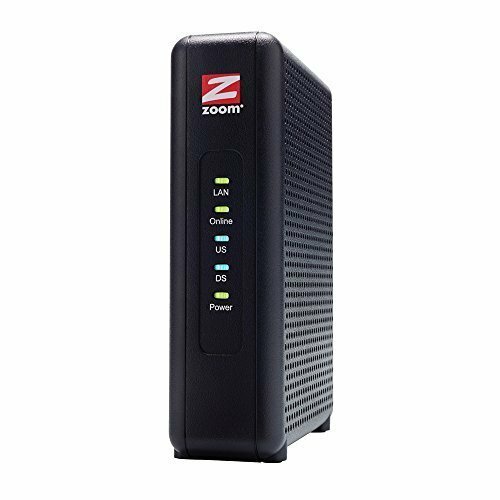 DOCSIS 3.0 and 3.1 compatible, with the potential to handle speeds up to 10x faster than basic 3.0 modems. Compatibility other than Suddenlink: Built for Comcast Xfinity, but also works with Cox and Mediacom. Not compatible with CenturyLink, Verizon, AT&T, or cable bundled voice plans. Uplink to router through 1 Gigabit (1000mpbs) ethernet port. Networking: No wireless; requires ethernet cable. 32 download channels work simultaneously for file downloads. Installation: Easy install through Suddenlink. Quick start guide available with product and online. A combined product means fewer wires, a simpler setup, and less that can go wrong–plus only one warranty to keep track of on the off-chance anything does. We also recommend its beamforming for a faster connection–basically, using several signals from different antennas to “push” the strongest signal the right way. Can be almost impossible to make changes to settings without contacting ISP directly. Also, as a combined modem/router, it’s susceptible to the problems with those that we mentioned before: if you want to change the settings for one, you’ve got to replace your entire home wi-fi setup. Speed: 16 download channels by 4 upload channels can handle download speeds up to 686 Mbps, but is most suited to internet plans that provide up to 300 Mbps. Compatibility other than Suddenlink: Comcast, Mediacom, WOW, Spectrum (Charter, Time Warner Cable, Bright House). Uplink directly to jack through 1 Gigabit (1000mpbs) ethernet port. Networking: Wireless router combined with a modem. Ethernet cable required to connect. 16 download channels work simultaneously for file downloads. 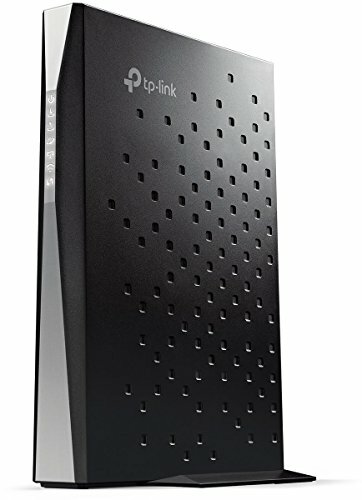 Installation: Easy to install yourself; quick start guide available through TP-Link website. Security: Complies with all DOCSIS 3.0 Medium Access Control (MAC) security standards, with encryption and the right for ISPs to refuse service to unlicensed modems. Changing your password from the default can help add another layer of security. Once again, we’ve got a simplified offering by means of a combined router/modem product. Also, assuming you’re in a home environment not dense with internet use, service is fast, almost never drops, and is able to reach throughout a 2,000-square-foot home without difficulty. Like #3, it’s impossible to make changes to just the modem or the router with a combined product. Also, while its range is good over distance, it can have trouble reaching through walls, and has a chance of decreasing through the life of the modem. Speed: DOCSIS 3.0 compliant. 8 download channels by 4 upload channels can handle download speeds up to 343 Mbps but is most suited to internet plans that provide up to 100 Mbps. Compatibility other than Suddenlink: Comcast, Cox, Cablevision, Mediacom, WOW, Charter, Time Warner. Not compatible with Verizon, CenturyLink, AT&T. 4-port ethernet router ensures ports won’t be a bottleneck to speed. Networking: Wireless router combined with a modem. Ethernet cable required to connect. 8 download channels work simultaneously for file downloads. Installation: Easy to install yourself, but professional installation is available. Quick start guide available externally through Midco. Security: Complies with all DOCSIS 3.0 Medium Access Control (MAC) security standards, with encryption and the right for ISPs to refuse service to unlicensed modems. Great at handling the speeds it’s built for. This is also one of the best on the list as far as its ability to exist in your home–it doesn’t get hot, and is built to take up very little space. That said, you’ll need a router to go with it, which might defeat the purpose of its compact design. Also, while DOCSIS 3.0-compliant, it’s not the best choice if you’re looking for a plan with higher speed. Speed: 8 download channels by 4 upload channels can handle download speeds up to 343 mbps, but is most suited to internet plans that provide up to 100 mpbs. Compatibility other than Suddenlink: Compatible with ALL United States cable ISPs (so not DSLs like CenturyLink). Uplink to router through 1 Gigabit (1000mpbs) ethernet port. Networking: No wireless; requires ethernet cable. 8 download channels work simultaneously for file downloads. Supports IPv4 and IPv6. Installation: Straightforward to do at home. Quick start guide available through Time Warner, and customer support through Suddenlink. Picking the best possible purchase in this contest wasn’t easy–and I warn you, the answer is provisional. All five of these modems (two modem-routers) fulfill their main purpose of freeing you from any rental fees you might have to pay Suddenlink. All of them are easy to install, and most are fast enough for any reasonable home wi-fi plan. That said, if you’re in the market for a Suddenlink-compatible modem, it’s impossible to beat the champion: the ARRIS Surfboard 6141 (the white model; don’t forget that the black model is refurbished). When the only flaw I can dig up is that the lights are too bright, you know you’ve got a solid product. 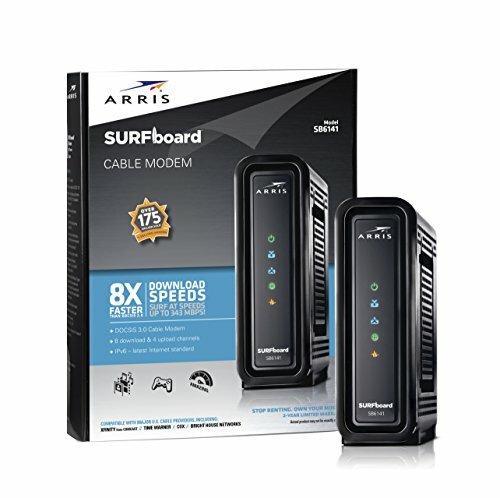 It’s fast enough to handle a 100 Mbps plan, which is all you’re likely to need; while a DOCSIS 3.1 with 32 download channels will impress the dinner guests, it’s the modem equivalent of flame decals on your car. The Zoom 5345 is a close runner-up, but it’s not quite saturated enough on the market to be certain of its effects in all situations yet. It’s a product to watch, however. As for the others, I’m hard-pressed to say when a combined modem-router is the best investment, as you can’t put a price on versatility. Are you a Suddenlink user? Do you have a favorite modem we didn’t mention? Let us know in the comments below!